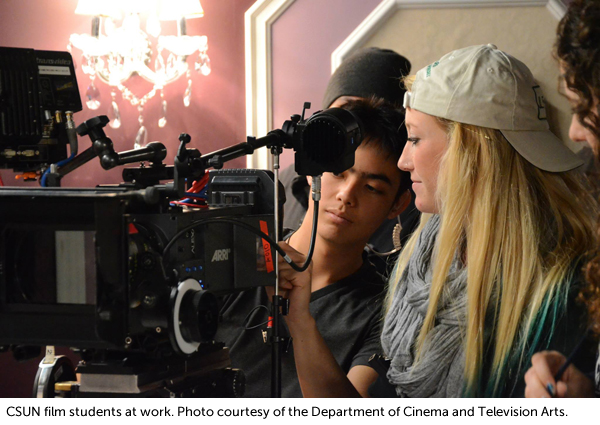 California State University, Northridge has been named one of the top 25 film schools in the country in the latest issue of The Hollywood Reporter. CSUN’s Department of Cinema and Television Arts joined the University of Southern California, New York University and University of Texas at Austin in a list of the best film programs in the United States, compiled by one of the nation’s leading entertainment trade magazines in its Aug. 8 issue. Department chair Jon Stahl hailed the ranking. Cinema and television arts professor Nate Thomas, who heads the film program, agreed. Stahl noted that the program’s location, in the San Fernando Valley near the heart of the entertainment industry, allows students to land internships and learn directly from working professionals, many of whom teach for the department or have served as visiting lecturers. Those professionals include Robert Townsend, James Burrows, Darren Star and Robin Swicord. Acclaimed director Donald Petrie, a CSUN alumnus whose credits include “Grumpy Old Men” and “Miss Congeniality,” has served as artist-in-residence in the department and continues to work closely with students as an adviser to all senior film project directors. Full-time faculty in the department also have won awards for their creative work — including Emmy and PEN Literary Awards — written trendsetting textbooks and mentored students whose works screen at film festivals around the world. The program has state-of-the-art facilities, including a theater that runs the regular film series CSUN Cinematheque, and holds classes every semester on nearby studio lots. Another significant facet of the department is its new MFA in Screenwriting program. Notable alumni include Petrie, screenwriter Dale Launer, actor/director Joan Chen, producer Keri Selig, studio executive Glenn Gainor, director Paul Hunter and director Darren Grant. CSUN also is one of the most affordable institutions on the list, with tuition at $6,542 a year for in-state undergraduates and $7,786 for in-state graduate students.